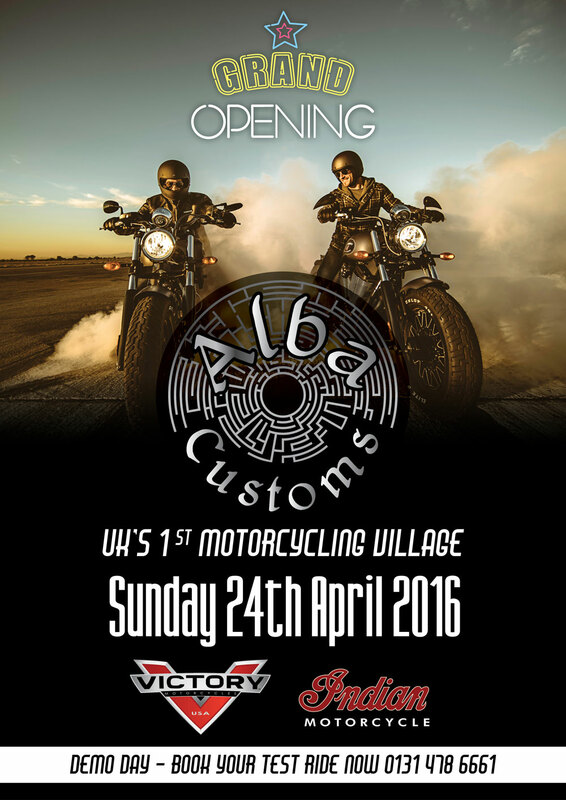 Scotland's premier destination dealership Saltire Motorcycles celebrates the opening weekend of Alba Customs, with their annual demo day, on April 24th. Alba Customs now boasts an all new dedicated showroom within the huge Saltire dealership complex, sitting along-side a new parts department and workshop facility. The dealership which is located on 553 Gorgie Road, Edinburgh, features an impressive new and used Indian, Victory and Norton Motorcycles line-up, alongside well-stocked clothing and accessory departments. Also new to the dealership are a bikers Destiny Bound Barber Shop, riders Cafe & Grill and DragonHeart Tattoo Bus - it's a petrol-heads paradise, worthy of a ride-out. Other special attractions on the day include live entertainment, pop-up trade stalls, a charity bike wash in aid of Poppy Scotland, Kids zone and a real biker party atmosphere. A comprehensive model line-up from Indian and Victory will be available to test ride on the day. Demo rides will be from 9am until 5pm, so to avoid disappointment, register in advance.